I have an esp8266 and I cannot get the value to read HIGH when 3.3v is applied to directly to pin by hand. I have an Arduino Uno powering the esp8266. It connects to the WiFi like it should, and now all I want is to manually see that when I apply 3v that the state will change from 0 to 1. Does anyone know how I can do this. When I apply 3 volts directly to pin 15 it outputs 0. Even if I try digitalWrite on the pin and set it to HIGH it still says 0 and i serialPrint. My end goal if to use the arduino uno to fire and ouput on pin 8. On the arduino UNO side I am using a super sonic sensor. When the sensor is triggered I want to turn pin 8 on. From there I want to take pin 8 to feed pin 15 on the 8266 as an input. Before I did that I just wanted to see that when you manually apply 3v that the pin would read 1 or HIGH but no matter I do it wont change value. Once I get that value as HIGH I can send a second request to the server like im already but now I want to say that there was an intruder. 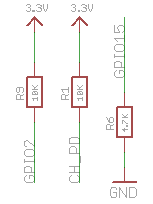 Im not sure why the value wont change but being a beginner with arduino Im trying to keep it simple and ideally would like to wire it in this manner. Pin 15 is one of the boot configuration pins (0, 2, 15) and must be LOW at boot. To ensure it, dev boards with esp8266 have external pull-down on pin 15 (and pull-up on 0 and 2). To read the pin HIGH you must overcome the pull-down. Adafruit Feather HUZZAH has 4.7kOhm resistor for the pull-down, so it is a 'strong' pull down. NodeMcu has 12kOhm resistor on io 15. Note: setting pin as OUTPUT and HIGH doesn't make it read HIGH in code. Only INPUT pin state can be read with digitalRead (only on some MCUs digitalRead reads the same register set by digitalWrite). Not the answer you're looking for? Browse other questions tagged arduino-uno esp8266 adafruit or ask your own question.